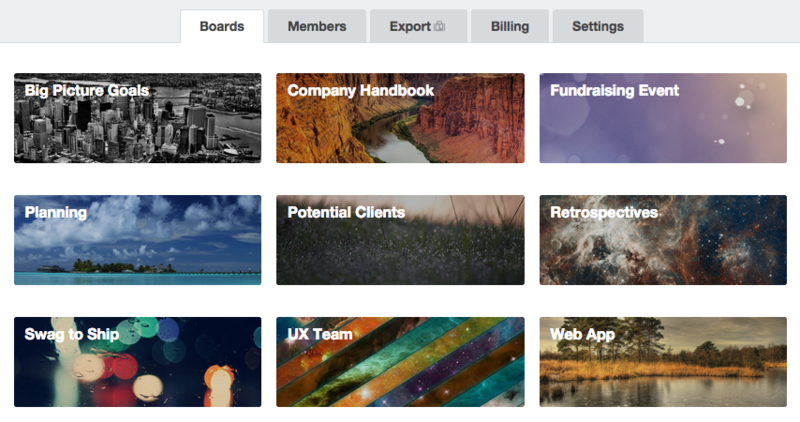 Each Trello Team has its own Team Overview, which shows you that team's boards, members, and settings. "Edit profile" will only show up if you are an admin of the org, and "Export" and "Billing" only show up if you are an admin of a team with Trello Business Class. This tab shows all the boards associated with your team that are visible to you. 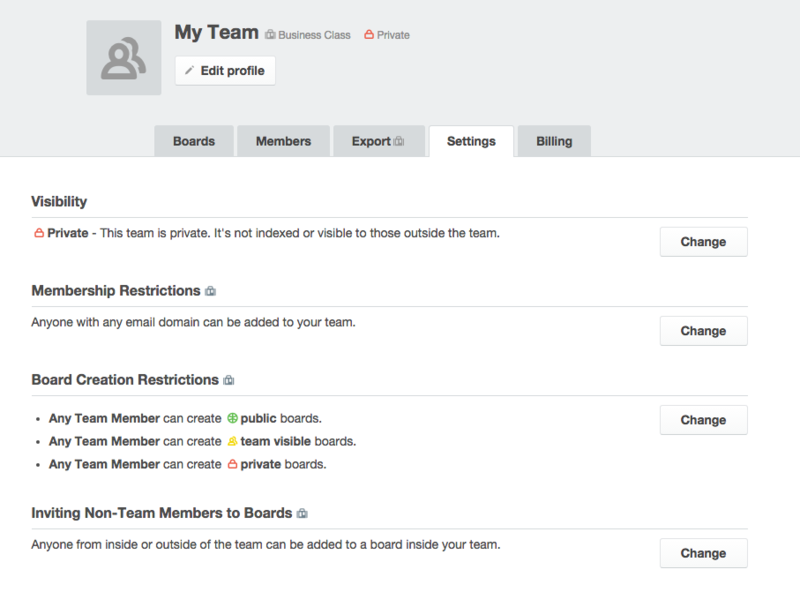 If you're the admin of a Business Class team, you'll be able to see all boards, even if they're private and you're not a member. You'll see all boards that are public, team-visible, or of which you're a member. If you're a member of a team on the latest version of Business Class, you'll also see collections on this page. 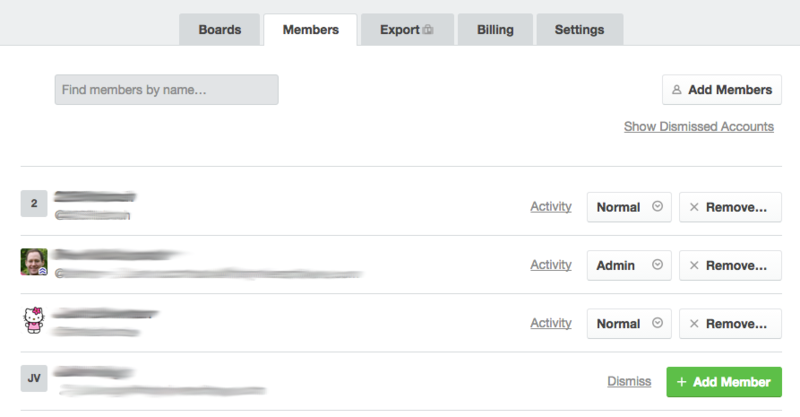 This tab shows all Trello members that are on your team, along with their permission level ("Admin" or "Normal"). If you are an admin, you will be able to change members' permission levels, or remove members from the team. If you have Business Class enabled, you can also enable the Google Apps integration on this page, which will cause members of your Google Apps domain to show up on this page, where you can easily add them. 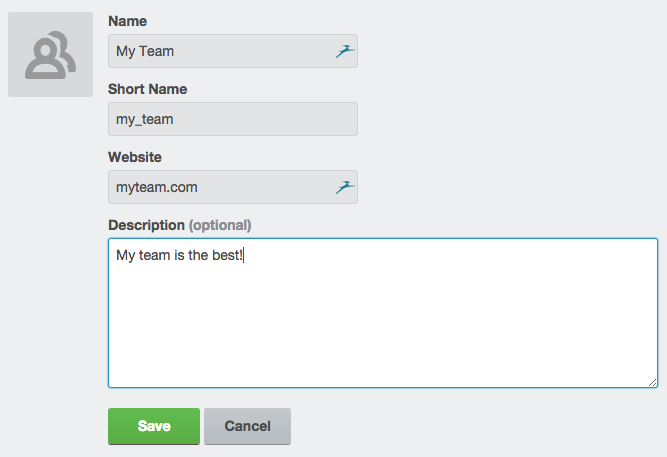 If you are an admin of a Business Class team, you can create a bulk export on this page. 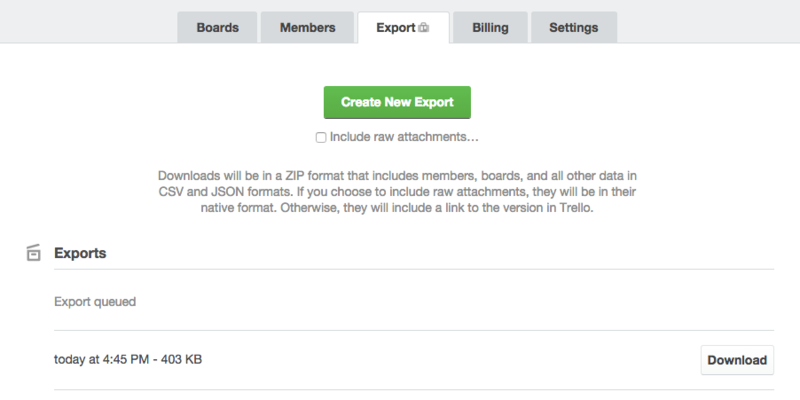 Click "Create New Export" and Trello will compile all of your boards in CSV and JSON format for you to download below. Depending on the size of your team's boards, it may take a while for the export to happen. Be sure to click "Include raw attachments..." if you'd like each boards' attachments (including card covers) to be downloaded as well. If you're an admin of an organization with payment information on file, you can manage your billing details on this tab. Under "Billing Contact", change the person who receives renewal and invoice emails. If you need to change the name, address, or CC for your billing details, click "Change Credit Card". Under "Billing History", you can see any past charges, and download the receipts and invoices associated with your team. 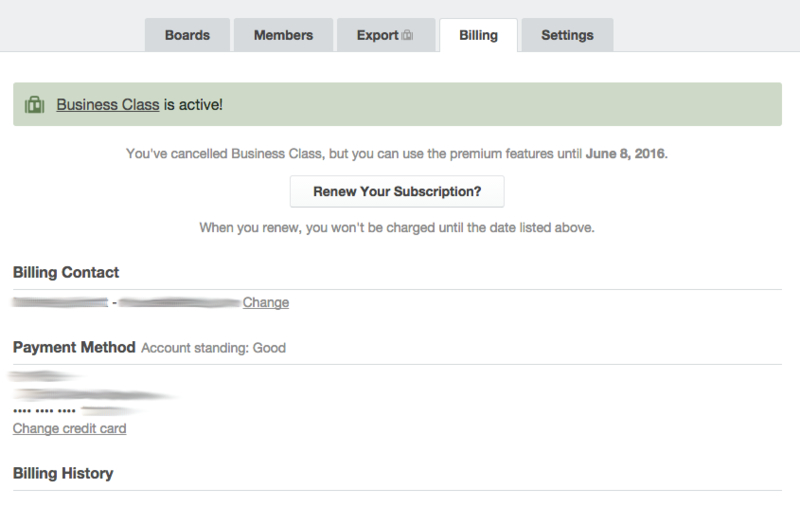 In addition, you can downgrade your team from Business Class by clicking "Cancel Business Class..."
On this tab, you can change your team's visibility, or, if your team has Business Class, edit additional permissions for your team (you can find the full list in the Business Class User's Guide). If you have a free team, or have downgraded your team from Business Class, you can also delete your team using the link at the bottom of the page. See Deleting a team for more details on that process.